All orders are processed securely by MyCommerce and PayPal and instantly delivered by us. All orders are processed securely by FastSpring and PayPal and instantly delivered by us. 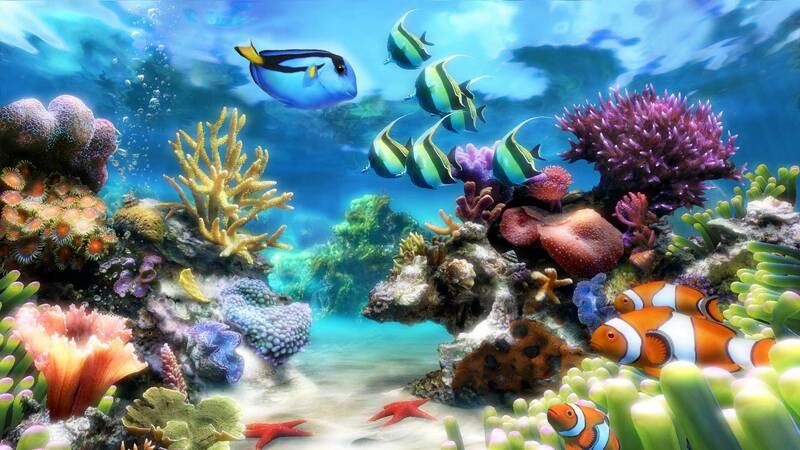 Five coral reef scenes, 30 species of fish, great white sharks and Live Wallpaper mode. Three anemone scenes, two Jellyfish scenes, 30 species of fish and Live Wallpaper mode. This is a life-time license for all our currently available and upcoming products with all deluxe features included. + Bonus two Key Codes which you can share with your family and friends. - How do I activate/unlock the Sim Aquarium? To unlock all features of Sim Aquarium, press left mouse button while screensaver is running to enter menu, click on "Unlock" button and enter your Key Code. - What are the advantages of Premium license? This is a lifetime license to all our currently available and upcoming screensavers, live wallpapers and games. It comes with two additional Key Codes which you can share with your family and friends. Minimum recommended graphic card is ATI Radeon 3xxx or NVIDIA GeForce 8xxx (a ten years old hardware), but it may work well on older graphic cards. The best way to make sure Sim Aquarium will work on your computer is to try it out. Lost or have not received Key Code? Digital Illusions Software is a software development company established in 2000. Our main goal is to produce top quality software - powerful yet easy to use for everyone and most importantly, to stand behind all of our software products by providing first class technical support. Today our most successful product, Sim Aquarium, is the most popular and technologicaly advanced virtual aquarium in the world. It has been continiusly developed for more than ten years and it is still under development. Please feel free to download and evaluate our software. If you like it and are interested to buy it, we guarantee that you will not be disappointed. Not only you will get the best software in its class, you will also receive fast and knowledgeable technical support whenever needed. We stand behind all our software products and respect our customers highly. If you have any question or need any assistance regarding our software, please don't hesitate to contact us. Your e-mail will be replied within 48 hours or less. Thank you so much for visiting us and happy surfing!